You can listen to my piece This Is Not The Title. Skip to the end of this post, past all the verbiage and pictures, to the part about the sequel and then click on the link to hear my piece which is entitled This Is Not The Title. Some "serious" composers often have just a holy heck of a time picking titles for their creations. In my opinion this is because music is not really about anything; it's abstract. 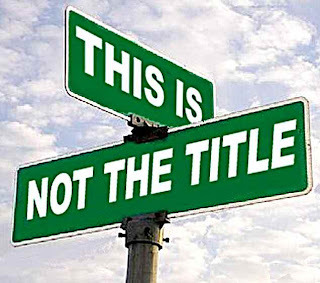 This recent New York Times article by Allan Kozinn discusses the problems composers have choosing titles. The wonderful blog The Detritus Review posted a totally pointless deconstruction of Kozinn's article. 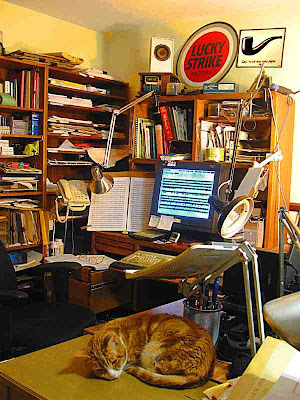 ... keeps a list of lines from films, television shows and advertisements, as well as random overheard phrases that catch his ear, pinned to the wall over his composing desk. I've been doing something similar for quite a while - except my "composing desk" is virtual and it's at Starbucks. And of course Caleb's composing desk is in New York, so it's more important than mine. Here's a picture of my real desk. You can click it to enlarge. Notice OJ the cat sleeping in the foreground. The music on the easel and on screen is John Adams' The Death of Klinghoffer. In the upper right corner, next to the Lucky Strike sign, is a famous picture of a pipe by Rene Magritte. The pipe picture probably inspired me to chose the title This Is Not The Title. I wanted to call it This Is Not Music. Unfortunately, unlike Magritte's title, This Is Not Music would be an outright lie. In our post-Cageian age anything can be music - even that crap he wrote. Or the crap I write. Or the crap you write. No matter what it is. No matter what we call it. Or not. "Enough about the damn title," I hear you say, "What about the music?" The music of This Is Not The Title was inspired by a host of irreconcilable musical moments which happened to cross my consciousness in sort of the same way I take pictures. It began with music I heard from this post, They Were Doin' The Mambo - Hillbilly Style at the WFMU blog. I also incorporated a small bit of a fifties R 'n B novelty tune about cavemen - sorry I can't seem to find that one again. And there's a Tito Puente lick in there as well. Later in This Is Not The Title there's a long exact quote from my piece Bombed. Bombed has three movements: "Into the Stone Age", "Pan Am 103" and "Out of Your Mind". Both Bombed and The Death of Klinghoffer were written in 1991. I have no clue what Scott is talking about but he's a professor so he must be making sense. I have never consciously listened to Yes, Gentle Giant or Incredible String Band. I do remember one Jethro Tull album in college because J.S. Bach wrote part of it. THERE IS GOING TO BE A SEQUEL!!!! This Is Not The Title has a sequel. I will post it soon. The sequel to This Is Not The Title also has a title - or maybe not. 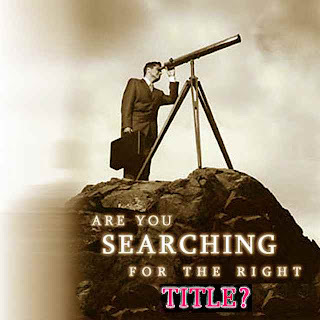 What do you think the title will be? What won't it be? Please feel to make suggestions - maybe your title will be no better than mine isn't. Copyright (c) 2008 David Ocker - 337 seconds. Interested in the self-reference thing? You should know about this book. This is not the title is the prequel to This is not the title EITHER. Listen to that here. Ring Festival L.A. - Wrong Festival L.A.